The thing I love about many new anime films is that they often serve to introduce me to excellent series I missed out on during the years when I didn't watch any anime. One of these is Anohana: The Flower We Saw That Day—a beautiful, heartbreaking story about loss. And as the theatrical film of Anohana will be released in Japanese theaters this weekend, now is the perfect time to look back at this excellent TV series. On the surface, Anohana is the story of Menma, a girl who dies in an accident, then returns as a ghost to haunt her best friend, Jintan, five years later. The problem is, neither Menma or Jintan know why she has returned. The two are quick to latch on to the “unfinished business” school of thought and decide that they need to grant Menma's wish to get her into heaven. Of course, neither of them have any idea what this wish could be. Thus the story is ostensibly about them trying to figure out Menma's wish and fulfill it. Of course, this is made all the more difficult by the fact that only Jintan can see Menma. Soon the two of them are forced to involve their old friends—who have drifted far apart over the five-year gap—and reopen many of the old wounds surrounding the events of Menma's death. 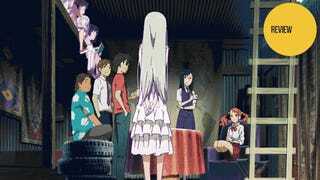 So when it really comes down to it, Anohana is the story of how Menma's death affected her five closest friends. Even though she died when they were in elementary school, their lives all still revolve around her death—or rather how they have attempted to cope with her death. Jintan has become more and more antisocial to the point of not going to school. Poppo has dropped out of school and travels around the world searching for adventure. Anaru blindly follows the popular crowd at school—doing anything to fit in. And Tsuruko has completely devoted herself to being the constant companion to Yukiatsu, the final member of the group. But it is Yukiatsu, who outwardly seems the most normal, that has fallen the furthest. His childhood love of Menma—and his jealousy of Jintan—has focused his life into a single obsession. And it is an obsession that cannot be maintained indefinitely nor without consequences. So while all five living friends have gone their separate ways in order to cope with Menma's death, the very nature of her ghostly predicament requires them to be drawn together again. This in turn violently breaks down each of the friends' emotional walls and makes for a truly heartrending drama. But it is not only the five friends who have had to deal with the catastrophic loss of a loved one. Menma's parents have also had a terrible time dealing with the loss of their daughter. Menma's mother has become a recluse, secretly hating that Menma's friends are allowed to grow up while her daughter is not. Menma's father has taken the opposite stance, trying everything in his power to not be reminded he ever had a daughter in the first place. But perhaps the worst off is Menma's brother, who can barely remember her, but is nonetheless constantly neglected by his parents because of their fixation on his dead sister. Jintan’s family is hardly better off as his mother died shortly before Menma—no doubt contributing to his self-isolation. Meanwhile, Jintan’s father has responded to the loss by letting his son grow up with complete freedom—which basically amounts to the freedom to do nothing. If you haven't guessed by reading everything else so far, Anohana is not a happy story. Rather it is a serious look at how the death of a young child has derailed the lives of all those close to her—even years after the fact. But that is not to say that there aren't happy moments. Nor is that to say that it isn't an uplifting and hopefully optimistic story—which it is. While the plot is filled with depressing revelations and heartbreaking drama, all the exploration of loss has a point. In the end, it is a story of love, letting go, and doing the right thing for the right reason. Anohana: The Flower We Saw That Day is no doubt one of the saddest anime I have ever watched. But it is also one of the most uplifting. The story it tells is so painfully real—so emotionally raw—that it will cause even the most jaded heart to weep. As loss is a universal part of the human condition, I would recommend Anohana to absolutely anyone—but only if they were prepared to have a good cry. Anohana: The Flower We Saw That Day aired on Fuji TV in Japan. It can be watched for free and with English subtitles in the United States at Hulu and Crunchyroll. The theatrical film will be released in Japanese theaters on August 31, 2013.